I decided to take advantage of my break in translation and make a post that I've been planning to write for a couple weeks. I am very much concerned about the state of our education system here in Russia, and one of my primary concerns is foreign language teaching. The communicative approach to teaching foreign languages is very fashionable now here. From now on I'll talk mainly about English, but it's true about other languages taught in our public schools as well. I don't have anything against the communicative approach... apart from the fact that it doesn't work in a situation where a language student doesn't LIVE in an English-speaking country or doesn't have a chance to listen to foreign speech and to interact with English speakers. Yes, it's easier to learn foreign languages these days, because there's Internet, there are numerous foreign TV channels, games, movies etc. I really like the example of this family: they are trying to study the language TOGETHER, so they've developed some methods that work best for them. But the reality is that not every family can live a foreign language like that family. Parents of my students are usually very busy people because life's expensive, and the level of our salaries here doesn't in any way match the rising prices (no matter what our president says: if we believe everything they say on TV we'll think the communism is right here round the next corner). So people often have to juggle two-three jobs in order to provide for their family. That's sad. And as the parents sink in their own problems and get overwhelmed with other issues, their children are often left to solve their school problems by themselves, which means that they only get worse. 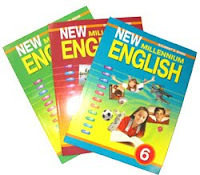 Here are the English textbooks that are used in many public schools here. They represent the classical communicative approach. I love the stories there and the level of complexity, BUT using them requires a whole lot of additional work in class in order to help the students understand and learn to apply the new vocabulary, grammar and phonetic rules. And since those additional exercises are not included in the textbooks (some examples are present in the teachers' books but there's definitely a need for a lot more of them), teachers really have to use their own imagination a lot. Unfortunately, the teachers for the most part don't do that. So poor children have to guess why they have to pronounce "door" in a different way from "too", what does "shall"/"will" mean as all they've covered so far are Present Simple and Present Progressive tenses etc. And by the way, I hate the way new tenses are introduced there. From the very first lesson with a new tense you'll see affirmative, interrogative and negative sentences right away without any explanation, and the kids are supposed to guess how to use them by themselves. I remember well how our "Methods of teaching foreign languages" teacher (he could speak many languages, three of which were his native tongues: German, Hebrew and Russian) repeted over and over again that we need to introduce any new aspects, including grammar step by step: affirmative sentences first, then questions, then negations etc. Students need time to digest new information and to be able to use it! Hope you know what I mean by now. Most families have to hire English tutors (like me), who would explain all those issues that are not explained at school, who would do all those additional excercises that are not done at school etc. I love being a tutor and a translator, but I am sure the process of learning a foreign language would go a lot better and kids wouldn't hate it as much if the Ministry of Education here either changed the textbooks and/or trained the teachers to use them right. By the way, I found a great website with English language games. Hope it's helpful to somebody. I also like this blog where you'll see some language issues explained quite well. How are foreign languages taught in your native country? What problems do you see in the educational system specifically concerning the foreign language teaching and what do you think should be done in order to solve those issues? P.S. To be honest, not all teachers in our public schools are lazy or don't care for the quality of education. Another problem is the scheduled hours for each subject. The curriculum gets harder, but hours either stay the same or (more often) shrink, so it's impossible to explain everything in class. Yeah, you're right Elena. That's also one of our huge problems, and not just with teachers, but with practically any profession or trade (excluding Moscow, it's a different planet).